It’s not often something inspires and depresses you in equal measures. The above video by educational YouTube channel C.G.P. Grey achieves that in 15 minutes by concluding that automation is inevitable. The robot revolution is well underway, and will soon turn us humans unemployable, through no fault of our own. University of Oxford Associate Professor Michael Osborne looked at over 700 U.S. professions and estimated 47% will be taken over by computers and machines within the next two decades. 47% of jobs lost would double the highest unemployment rate during the Great Depression. Technology is replacing real jobs and will continue at a record pace. This is not some tomorrowworld, rather it’s happening right now. For instance, driverless cars and buses will be in 30 U.S. cities by the end of next year, with Tampa, Florida being the first unveiling in a few weeks. At first, these automated people-movers will be on college campuses, airports, and downtown areas. Then it’s only a matter of time before regulations allow highway use across the country. Related: What the Future Holds for Driverless Cars and Data Centers. Elon Musk predicts that “true autonomous driving where you could literally get in the car, go to sleep and wake up at your destination” will be the norm by 2020. Think of the jobs impact with this one change alone. The Bureau of Labor Statistics shows 884,000 people are employed in motor vehicle services, with an additional 3 million in the dealer and maintenance network. Truck, bus, taxi, and delivery drivers account for nearly 6 million jobs, and they too will no longer be needed. That’s at least 10 million jobs that will be obsolete in the U.S. alone. This doesn’t include the ripple effect this will have, like entire claims and insurance departments becoming extinct. Who Else Will Lose Their Job? As you can see, automation isn’t just coming for blue collar and manual labor jobs. 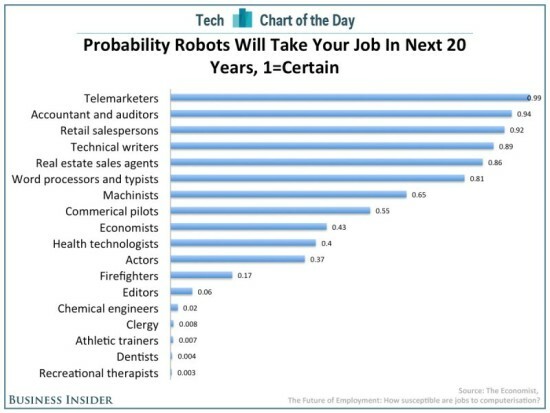 Many white-collar jobs can and will be replaced by smarter robots. High paying occupations like airline pilots, accountants, and real estate agents will all succumb to software soon. Not even doctors and lawyers are safe from artificial intelligence. Silicon Valley billionaire investor Vinod Khosla predicts that algorithms and machines will replace over 80% of doctors within a generation. Lawyers are already seeing competition from places like LegalZoom.com, which offers a plethora of legal solutions without having to see an actual lawyer. After all, a robot can absorb and understand entire legal codes in a fraction of the time it would take a human to research and understand. Even articles like this are being written by robots. The Associated Press recently partnered with Automated Insights, a company producing personalized narrative content gleaned from Big Data. AP usually published about 300 companies earnings reports each quarter; now they will “write” 4,400 earning reports in that span. Automated Insights says their platform generates millions of articles per week to companies like Yahoo, who’s fantasy football blurbs have been automated for years. What Happens When All the Jobs Are Gone? By replacing the human workforce with robots, humans will be struggling to make an income. With mass unemployment to virtually all job fields, there won’t be many left who can buy what the robots are making. For as long as we can remember, our economy has been based on a cycle of work-for-income and income-for-survival. This economy will not be sustainable in the automation age. A guaranteed universal basic income, a social dividend of sorts where all citizens receive a sum of money, seems inevitable. Hopefully, future generations will work less to survive and instead spend their time on meaningful activities for themselves and humanity. When you were growing up, did you dream of staring at spreadsheets in a cubicle, or did you want to become an athlete, musician, astronaut, writer, explorer, a creator of something you can be proud of. Automation strips away performing mundane work and instead grants us time to create, to enjoy what we’ve built, and to reach for the stars. 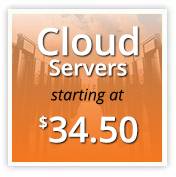 HostDime.com, Inc is a global data center infrastructure provider offering an array of cloud products from managed hosting servers to colocation services that cater to a range of clients, from entry-level to enterprise-level operations. HostDime owns and operates infrastructure and networks in seven countries, with its flagship facility in Florida, USA. Currently with a client base of more than 50,000, HostDime is one of the most reputable data center companies in the world. This article was written NOT by a robot, but by Jared Smith.